Twitter on Monday announced plans to launch stickers in its mobile apps, letting users customize their uploaded images with premade graphics. 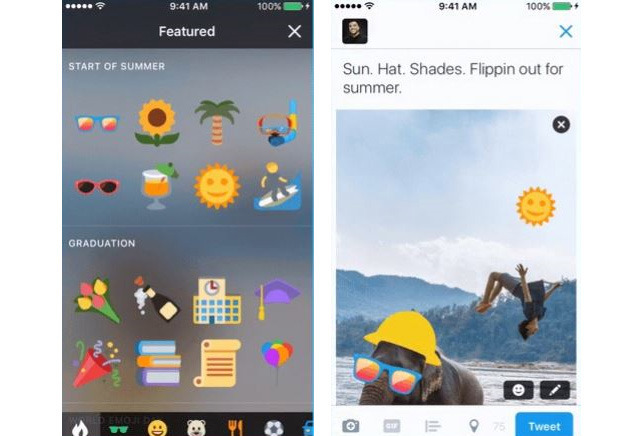 The feature is rolling out to iOS and Android "over the next few weeks," Twitter said. When editing a photo, people will see a new Stickers tab, which includes various accessories, emoji, and props, sorted into their own tabs and themes. These can be rotated and resized for the best fit. Tapping on a sticker in an uploaded image will bring users to a separate Twitter timeline, highlighting various uses of it around the world. People browsing Twitter on the Web will be able to view and click on stickers, but not apply them to uploaded content. Except for the social hooks, the feature resembles sticker functions in some other mobile apps, including iOS 10's updated Messages. Twitter is well ahead of Apple timewise —iOS 10 won't launch until sometime this fall, most likely in September.